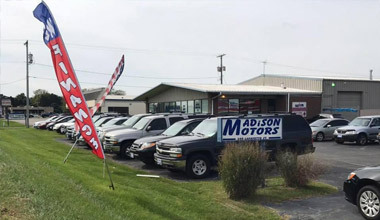 Madison Motors of London, Ohio where Lisa and Lindsay Sell Good Cars To Good People! Buying a vehicle can be stressful and time consuming. We promise that your experience at Madison Motors will not be either of those!! Mission: To offer a different car buying experience by being honest and fair with our potential and current customers at all times. Our culture values family, friendships and our community. We keep our focus on the value we bring and honor that always. Welcome to Madison Motors where we care about our customers. Many of our customers have become close friends and repeat customers. Before a vehicle hits our lot, it is checked over and any needed repairs are completed. We strive for you to drive away in a vehicle that will not need any work and/or repairs for quite some time. Things do happen (they are used cars.) We will always work with you to get your vehicle repaired either on site or at one of our preferred repair partners. Our specialty is our Lease to Own Program. To serve customers who do not meet the Lease to Own qualifications we also offer a Buy Here Pay Here program. To schedule an appointment with Madison Motors please fill out the form below. After we receive your request, we will contact you to confirm the appointment. For immediate assistance, please call us at (740) 490-0028. Your next car is waiting at Madison Motors. Browse from a variety of makes and models for sale in London, Ohio. To speak to a representative, give us a call at (740) 490-0028. If you have bad credit, poor credit, no credit, or even special financing needs, we have a solution for you! Our Buy Here Pay Here program allows you to finance the vehicle right through our dealership! Regardless of your credit history, Madison Motors can help you get into a car today! Get the payment you want! At Madison Motors we are leasing specialists! Lease any one of our pre-owned vehicles at a comfortable payment for you! You can now own a serviced and clean car that is at a comfortable payment you can afford! "Great customer service ! Lindsay and Lisa were super nice from the moment i stepped in the door. Very helpful and friendly !" "Always Friendly and an amazing place will never find another car dealer like this and will never go anywhere else with my business"
"The staff was absolutely amazing and really worked with me on getting exactly what I wanted at a very affordable price and payment plan. I didn’t feel like I was walking into a normal car lot it was small and more personal than a normal experience and I left there very happy and pleased with my service. I would definitely recommend them to anyone."